As Brian was vacationing in Belize the last few days, I was happy he was enjoying warmer weather & the waves, but I won’t lie – I was a little jealous. The timing just didn’t work out quite right, as I needed to be in Washington D.C. for a food writing conference, which I’m so glad I went to. I imagined he was soaking up the sun and eating fresh seafood, along with a few margaritas. So I decided the next best thing I could do was create that scene here with fresh and vibrant Fish Taco Lettuce Wraps. Spring rays were shining into my kitchen, and I was happy with lemon & lime sparkling water instead of a margarita. And with the smell of chopped mangos & kiwi, I was as close to the Caribbean as I could get. Growing up I didn’t each much fish/seafood besides the occasional walleye dinner or the winter Fish Fry at the local American legion – both small town Minnesota staples. As I grew older, I certainly started ordering more fish when dining out and came to enjoy salmon, sea bass and scallops. For some reason I still hesitated to cook it myself though, for fear of not knowing how to cook it without completely ruining it. Wouldn’t it stick to the pan? How do I know when it’s done? Since starting AIP that has changed, and seafood has become an important part of my weekly menu. And honestly, I’m kicking myself. It’s so quick and easy to make – this recipe takes just 20 minutes. I discovered the key to getting it to not stick to the pan was using a high heat oil, coconut (which also adds great flavor) and not letting the pan get too hot. It only takes about 3 or 4 minutes per side and when it flakes, it’s done. It’s much easier than mastering the art of sautéing a chicken breast without it sticking to the pan, and a breeze compared to cooking a steak to the perfect doneness. One thing I really like about wild Alaskan cod is it’s texture & flavor, particularly when thinking about fish tacos. It’s firm, yet flakes nicely without falling apart, which happens with some other varieties like tilapia. 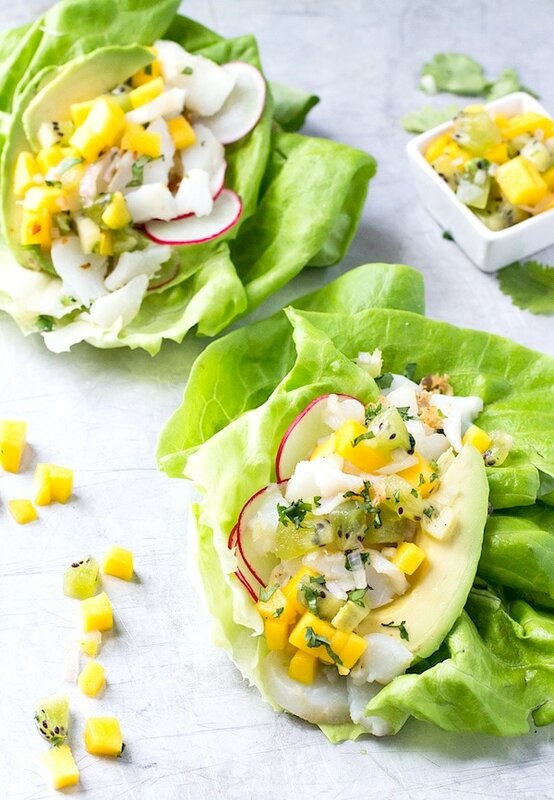 You want that perfect bite of fish, mango salsa and avocado all at once! Also, if you tend to shy away from “fishy” fish, cod is for you – it’s mild and delicate in flavor. As for our nutrients, our bodies can absorb and use the Omega 3’s and 6’s from fish at a much higher rate than that from meat. It’s a great source of protein and has many minerals and essential oils that we need, yet are difficult to get from other sources. I’ve noticed it’s much easier to find sustainable, wild caught seafood at most grocery stores compared to pastured and grassfed meat (sad but true) – both scenarios a must for the Autoimmune Protocol because if the fish are farmed or animals are vegetarian fed, that means they are eating grains. Which then means you are eating grains – no bueno for healing leaky gut. I know I said a lot about the fish, but the Mango Kiwi Salsa, radishes and avocado really round these out. So fresh and bursting with flavor, that salty sweet combo I love. Whether you’re looking for a new condiment or you’ve been missing salsa because you can’t tolerate nightshades, it’s a great addition to your refrigerator. Enjoy! I discovered the key to getting the fish to not stick to the pan was using a high heat oil, coconut (which also adds great flavor) and not letting the pan get too hot. It only takes about 3 or 4 minutes per side and when it flakes, it's done. Combine all salsa ingredients and add salt to taste. Set aside. Rub cod with 1 tablespoon melted coconut oil and salt. Heat a large skillet with the remaining coconut oil in it to medium high heat. Once pan is hot, lay fish fillets into it and cook for 3-4 minutes, then flip and repeat with the other side until meat flakes away and it is seared. 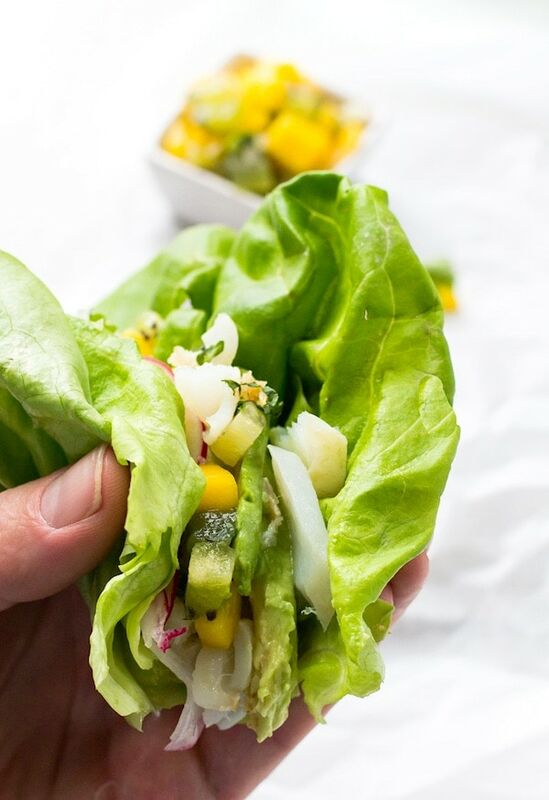 Place fish into lettuce leaves, lay avocado slices up against it, and add salsa and radishes. These look so fresh and yummy, Amanda!! Thanks for the inspiration! Wow, these fish tacos look SO fresh and vibrant! I have been loving all the wild Alaskan cod on fish Friday’s – so good! This looks perfect for dinner tonight! 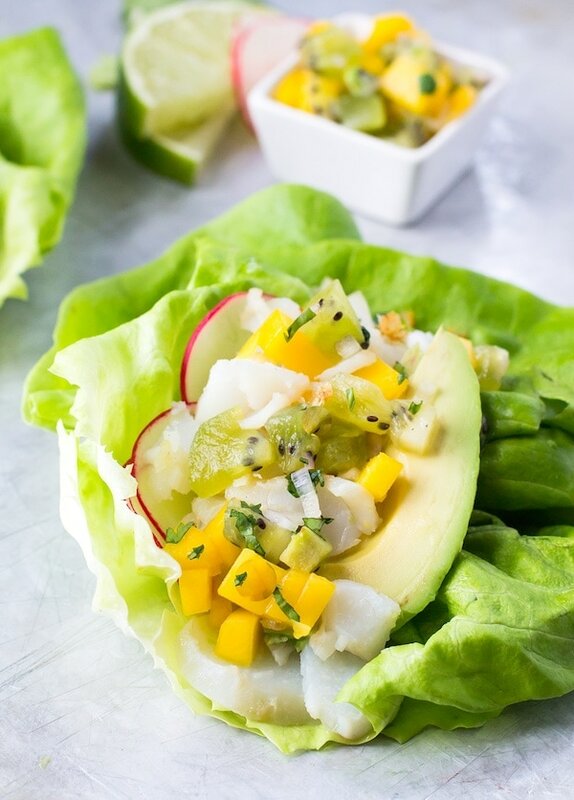 I was playing with a mango salsa for some rock cod over the weekend, and never thought to add kiwi! Fabulous! Thank you for solving my dilemma of what to have for dinner tonight! These will be perfect!! These look so delicious! I love the kiwi in that salsa. I haven’t historically cooked much seafood either, but I’m finally getting into salmon. Cod is now next on my list! Yay, I love salmon too! It’s nice to have a change of pace, and the cod really meshes well with the savory fruit salsa. Kind of fun to expand cooking horizons. I know EXACTLY what you mean here. I, too, was very hesitant to get into cooking fish – it seemed like this whole unexplored world! But now I just can’t believe how amazing it tastes, and how easy it is to prepare. Oh fish, where have you been my whole life? Right? It’s so nice to have another thing to form a meal around. And I’ve been so impressed with how accessible it is. I’m still coming around to some of the seafood like mussels and oysters, but I have a feeling I’ll be enjoying those soon too. What a great recipe! So fresh and vibrant. I loooooove fruit salsa, so this sounds wonderful to me. So so lovely! The colors are stunning, and lettuce wraps are the best. Just looking at these puts me on a beach somewhere, so fresh and light! Mmmm! First of all, I think you should get to go to Belize too. Second of all, I want to eat the heck out of these gorgeous fish tacos. They look so fresh and springy! Love ’em. Your photos are so beautiful! Next time we have fish I’m going to remember this. It’s a wonderful idea! Oh, goodness. These are so bright and fresh! Just what I needed to see after a long winter: Colorful food! Love the flavors you’ve combined here Amanda! The fact that it is easy enough for a weeknight meal makes this a winner! I usually cook salmon, but this makes me want to try cod too! 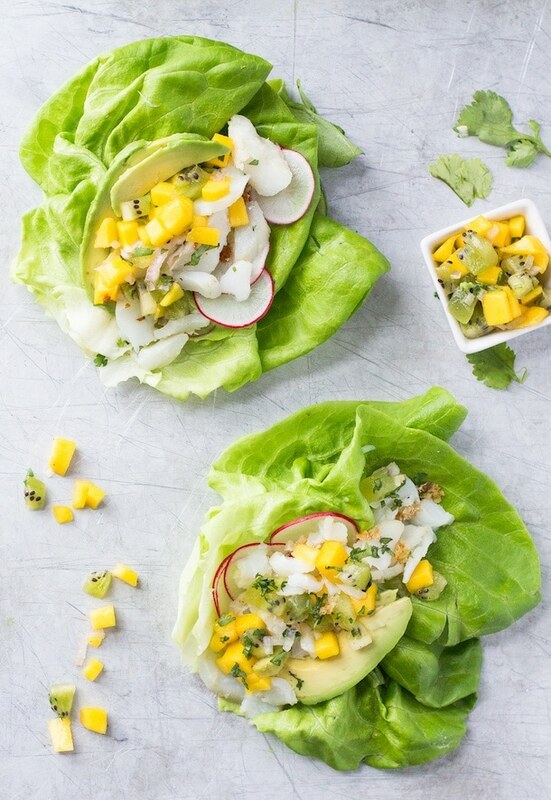 I love Fish tacos, and the lettuce wraps are a great idea! I grew up on the west coast of Scotland so we ate a lot of fish including cod and haddock, they are hard to come by in Mississippi though :) You have some beautiful photographs, everything looks so tasty. We do tacos quite a bit around here, but never in lettuce leaves and never with a fruit salsa. I LOVE these ideas! Thanks for the inspo! So pretty and light and flavorful, perfect for spring! What delicious tacos.. I love how fresh, healthy and light they are. This recipes makes me wish for hot summer weather again! Hi Thalia! I am so ready for summer too. Fish tacos by the pool and friends! I’m just drooling like crazy over here. Don’t mind me. I’m jealous both of Belize AND your writing conference. 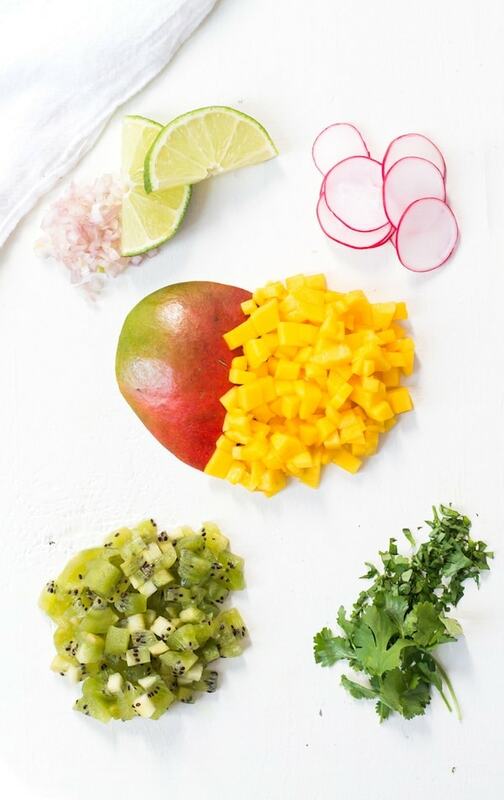 I think you’ve captured the essence of the sunshine in these tacos and the mango kiwi combo sounds so refreshing! Definitely adding this to my dinner list! I just made these tonight and O M G these were good! So simple to make, yet so divine. I can see me regularly making this dish for the rest of my life… myself, then my husband, then my kids, then my grandkids… I sincerely enjoyed these that much! Thanks so much for posting the recipe. Just a note, I forgot to buy a lime so I used a lemon and it still blended with the flavors decadently. yay – so glad you enjoyed the recipe! and thank you for taking the time to comment. great substitution with the lemon!